Helix strings represent a giant leap forward in the evolution of string technology. 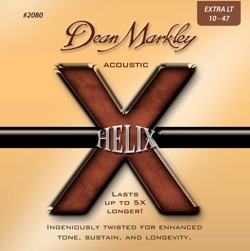 Helix’s patent-pending Elliptical Winding process brings new life to your music with a smoother feel, and a richer, more resonant tone that is unrivaled by con..
Helix strings represent a giant leap forward in the evolution of string technology. Helix’s patent-pending Elliptical Winding process brings new life to your music with a smoother feel, and a richer, more resonant tone that is unrivaled by conventional strings. The Hyper-Elliptical compressed winding process allows for an increased number of wraps across the length of the string without altering its diameter, resulting in fuller tone, incredible sustain, and an increased life span. In fact, Helix strings last up to five times longer than other strings! True brass alloy well-balanced and durable for loud, rich, true sound. Its tighter windings deliver a smoother feel as your fingers glide more easily and smoothly along the surface of the wrap wire. Creates a sound and performance unrivaled by any other conventional string.